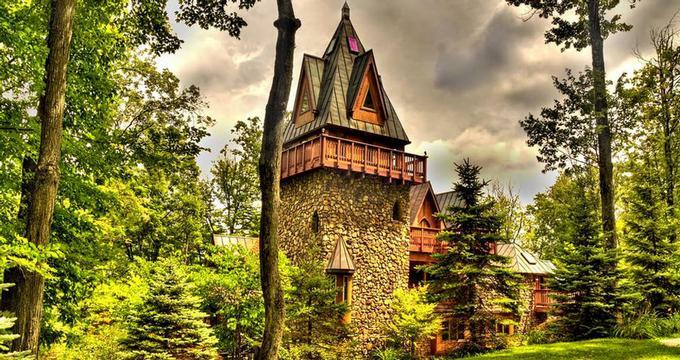 Nestled deep in the heartland of Mohican Country in Ohio, Landoll’s Mohican Castle is an Old World-style hotel and estate that offers unprecedented luxury and tranquility. Situated one and half hours northeast of Columbus in Ohio, Landoll’s encompasses the stately majesty of times past with accommodations fit for kings and queens, fine dining, exquisite venues for weddings and corporate functions and an array of activities for every desire. Landoll’s offers a variety of beautiful accommodations in the form of luxurious guest suites that have been individually decorated to create their own charm and appeal. The Barton Suite offers a quaint, intimate retreat for two with exquisite cherry hardwood floors and trim, hand-applied, faux-finished walls and ceilings in rich, earthy tones and hues. The Suite features a queen-size bed with plush linens and a beautifully-appointed Italian-tiled bathroom with glass-enclosed shower and Jacuzzi tub. The inviting living area has a comfortable, antique leather chair, oriental rugs and a gas fireplace featuring original stonework from the early 1800s. Modern amenities abound, including a convenience kitchen with granite countertops, microwave, fridge/freezer, ice maker and wet bar and a copper top table and two wooden chairs. The suite has a flat screen television and enjoys a private exterior entrance with lovely views over the gardens. The Hess Suite is spacious and airy with Oriental-style rugs, hand-painted porcelain tiles and a gallery of pastoral oil paintings. The suite is tastefully furnished with wood, leather and iron finishes, a plush leather recliner and queen-size sleeping sofa. The bedroom has a king-size bed with leather and metal crown headboard, oversized pillows and luxurious linens, and an en suite bathroom is fitted with underfloor heating, a glass-enclosed wheelchair-accessible shower and a luxurious Jacuzzi tub. A bay window offers beautiful terrace views, and a marble sink with brass fixtures sits below a handcrafted mirror with hand-painted porcelain tiles. The sitting area boasts a gas fireplace with original stonework from the Landoll Estate and arched hickory windows boast stunning garden views. Modern amenities abound, including a convenience kitchen with granite countertops, microwave, fridge with ice maker, wet bar and a copper top table with two rattan chairs. Regal ambiance permeates every corner of the impressive executive Lawrence Suite from the 20 foot high cathedral-style ceiling with lion head brackets to the handcrafted iron leaf candelabra chandelier. Old World estate-style furniture is complemented with cherry hardwood floors and Oriental-style rugs and tapestry-draped bay windows frame beautiful scenic woodland views. The bedroom features a king-size bed with carved headboard and crested throw pillows and a queen-size sleep sofa is available for extra guests. A stately en suite bathroom boasts underfloor heating, Gothic-style Étagère stands with marble shelving, a spacious Jacuzzi tub and walk-in shower. The royal theme is carried through in the living room with a marble top coffee table adorned with regal lion heads, leather-strapped wrought iron chairs and a massive stone fireplace handcrafted with stones from the Landoll Estate. Additional conveniences include a kitchenette with microwave, wet bar and fridge, and dual built-in televisions. The Buchheit Suite is bright and airy with four large bay windows offering brilliant views of the castle’s woodlands. The bedroom features a hand-carved, queen-size four-poster mahogany bed draped in sheer voile and gorgeous linens, and a full-size sleeper sofa for extra guests. The luxurious bathroom has underfloor heating, a glass-enclosed, angled shower and a Jacuzzi tub. The living area boasts cherry period-style furnishings, Oriental-style rugs and a wrought iron and stone gas fireplace with stone hearth. A cozy kitchen nook has a mini-fridge/freezer, microwave, ice cube maker and wet bar. The Ross Suite enjoys resplendent décor in gold accents, Old World Italian-style furnishings, scenic pastoral artworks, luxurious velvet chenille tapestries and Oriental-style rugs. A king-size bed with an intricately carved headboard and luxurious linens takes center stage in the bedroom, along with a wrought iron and stone gas fireplace, a television is cleverly hidden in a princess armoire. The luxurious bathroom has underfloor heating, a glass-enclosed, angled shower and a Jacuzzi tub and a beautiful bay window overlooking the breakfast terrace and flower garden. A separate dining area with a marble-topped dining table with four chairs is ideal for entertaining and a full-size sleep sofa offers a place to sleep for extra guests. The spacious Hardesty Suite has a Royal Flemish theme with an intricate arched walnut beam ceiling, ornate gas fireplace and Flemish medieval-period tapestries. Exquisite décor includes a grand entranceway with glass sidelights, Venetian bronze-finished chandeliers, Edinburgh gentry game chairs and Oriental-style area rugs. Bedecked in hues of navy, burgundy and antique gold, the bedroom features an Old World-style king-size bed with hand-carved headboard, antique gold draping and beautifully trimmed bedspread. The Italian-tiled en suite bathroom has a marble sink with brass fixtures, glass-enclosed shower, Jacuzzi tub and Gothic-style Étagère stand with marble shelving. Additional suite amenities include a convenience kitchen area with modern facilities and wet bar. The Gale Suite is a secluded suite for two that offers beautiful views of the castle woodlands, spacious living areas with plush décor in warm tones and a turreted, vaulted ceiling. The suite is entered through a private entrance into a lovely sitting area with a twin pullout couch, oversized armchairs and tapestry brocade, naturally lit by arched windows. A cast iron and gas fireplace with original stone hearth create a cozy ambiance complemented by walnut hardwood floors are accented with Oriental-style area rugs. The luxurious en suite bathroom boasts an octagonal skylight and arched cutaway ceiling over a double Jacuzzi, glass-enclosed shower and Italian-tiled floors. Additional suite amenities include a convenience kitchen area with a wet bar, mini-fridge, microwave, and ice cube maker, and the suite includes a television. The Kihm Suite offers a Gothic-style getaway with a private entrance, stairway adorned with Old English paintings, arched, Gothic doorways, ornate mirrors and intricate iron filigree work. An aristocratic feeling permeates throughout the suite, with marble-topped tables, Verde bronze lamps, a carved stone gas fireplace and Oriental-style area rugs. The bedroom features a king-size bed and wrought iron headboard with gorgeous linens and television while an en suite bathroom has heated floors, a glass-enclosed shower and Jacuzzi tub, marble sink and Gothic-style Étagère stand with marble shelving. A convenience kitchen features modern amenities and the suite has a sitting area with a television, and a private balcony has a comfortable secluded seating area with a queen-size sofa bed perfect for relaxing. The Thering Suite offers casual elegance and privacy with a private entrance, beautiful cherry hardwood floors, high angled ceilings, an artfully placed skylight and a private balcony that overlooks the castle grounds and gardens. A spacious living area features half-moon windows, Oriental-style rugs, leather ottoman footstools, an intricate wrought iron and gas fireplace, an overstuffed sofa bed and a copper top dining table with four wrought iron chairs. The bedroom has a king-size British Norton Hall maple bed with head and footboard and a luxurious en suite bathroom has underfloor heating, a walk-in shower and Jacuzzi tub and a gold trim mirror. A small kitchen area has the necessary essentials and the suite includes a television. Located next to the hickory tower with a private entrance, the Miller Suite is spacious and light with handsome views of the castle woodlands and cobblestone flower gardens. Exuding a regal ambiance, the bedroom features a king-size bed dressed in luxurious, crested linens and an elegant en suite bathroom has a private tub room with Jacuzzi bath, double shower, a pedestal sink and heated tiled floors. An intimate sitting room has an antique leather chair, a queen-size sofa bed and a handcrafted stone hearth gas fireplace featuring original stones from the estate. A kitchen nook offers modern appliances, a copper top dining table with four wrought iron chairs and a television hidden in an elegant cherry chest entertainment center. The magnificent Landoll Suite is a castle within a castle and offers discerning guests a luxurious escape. Turrets and spiral staircases lead from a private entrance to this opulent multi-level suite, which boasts panoramic views of the surrounding gardens and woodlands from the terrace. Grand décor abounds with hardwood floors, Gothic arched doorways and windows, custom leaf design tapestries, bronze ceiling fans, chenille chairs and leather ottomans. The bedroom offers a maple queen-size estate sleigh bed with royal blue linens and a full-size sofa bed is ideal for extra guests. A stunning en suite bathroom with high cathedral ceilings has heated floors, glass-enclosed shower, Jacuzzi tub and Gothic style stands with marble shelving. The spacious living area features a wrought iron and stone gas fireplace and a cozy kitchen nook has granite countertops and modern amenities, including essentials such as a microwave, fridge and wet bar. A copper top table with four wrought iron chairs is perfect for entertaining and the suite includes a television. Located within a short walking distance of the castle, four Highland Suites reflect the casual elegance of a country estate with soft mint green and pink décor, secluded dining nooks with fireplaces, spacious bedrooms and en suite bathrooms with double Jacuzzis and showers. Thane and Macbeth Cottages are two quaint stand-alone cottages located a short walk from the main castle that offers an ideal getaway for guests wanting an extra level of privacy and seclusion. Open-plan cottages offer comfortable bedrooms with king or queen-size beds, en suite bathrooms with double Jacuzzis and walk-in showers, convenience kitchens with microwaves, refrigerator/freezers and wet bars, and private terraces with outdoor hot tubs and beautiful views. Macbeth Cottage enjoys additional amenities, including a full sofa bed for extra guests, two televisions, a fireplace in the living room and a small deck. Stepping Stone Restaurant offers a casual, family-friendly dining experience with a full-service bar and special kid’s menus. Open for brunch, lunch and dinner, the restaurant has indoor and outdoor dining spaces and no reservations are needed. Simply turn up and enjoy a delicious array of seasonal American cuisine made from locally sourced ingredients against a backdrop of breathtaking views. A full bar serves a variety of beverages, ranging from craft beers, imported spirits and wines from around the world to soft drinks and freshly squeezed juices. Landoll's Mohican Castle is the perfect venue for a unique Ohio wedding, with complete wedding packages that cater for intimate weddings to large receptions for up to 200 people. The Mohican Country surrounding the hotel offers a broad range of outdoor activities from boating, kayaking, canoeing, fishing and golf to hiking, mountain biking, forest rambling and bird and wildlife watching. 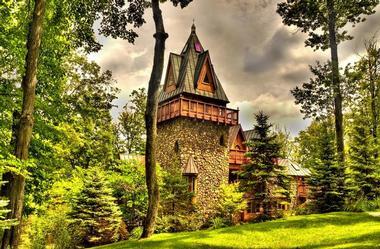 Steeped in history, Landoll's Mohican Castle offers unique guided ghost hunts and ghost walks that explore the rich heritage of the Castle’s paranormal past.